At April 28, 2016, the National Junior Men's Hockey championship opened in Kaiming school, Huai'an city, Jiangsu province, ACT industry as the tournament site builder and the sponsor, cheered and fighted for the athletes for the whole competition course, and witnessed the fierce competition lively. The tournament ended on May 5th finally, and the Guangdong team won the championship. This competition is the first time held in the school among the three national competitions, the venues equipments and the active preparations of Kaiming secondary school, ensured the smooth progress of the game. After the game, the players of the tournament gave high praise to the field which was chosen this time, the visual effect was having a unique style, and claiming that this pitch was completely able to match with the London Olympics hockey pitch! Its good water retention, water permeability, high resistance and excellent sense of possession, all made the players playing their best competitive state fully. The world's top hockey field, bring players the ultimate sport experience! ACT District Manager appeared in person at the scene and gave full support during the whole course, also offered attentive service, and assisted customers to creat their maximum value!!! This blue and pink beautiful hockey pitch actually have been frequently used 4 years, it was built by ACT industry at 2012, strictly according to the London Olympic Games Standard, and won the highest level certification venue certificated by International Hockey Federation, it is also able to host the Olympic Games and other top international events. Hockey grass is the highest standard of artificial grass industry, there are only few domestic manufacturers having the production capacity of this product. 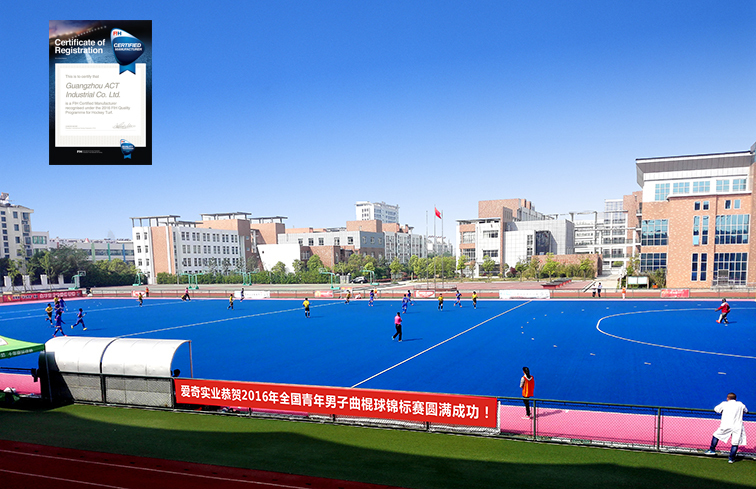 Since the beginning of 1994, ACT has created the first pitch of hockey field in China -Guangdong Olympic Sports Center No. 1 field, and it also has been completed the construction of 18 high quality hockey fields at home and abroad successfully, and won the International Hockey Federation recognized. 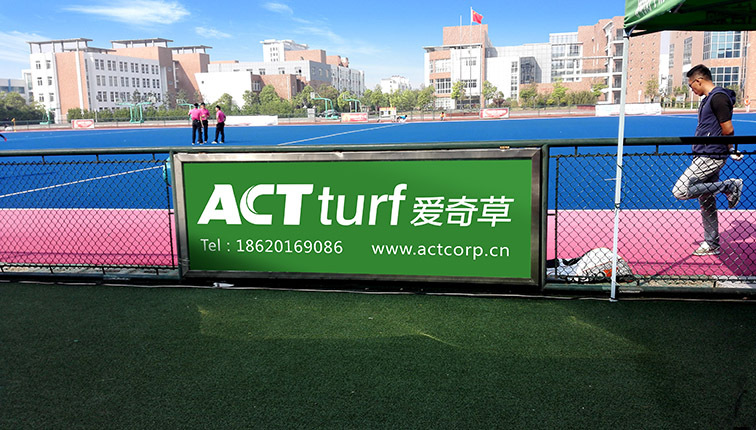 ACT hockey grass: Among the domestic brands of the artificial hockey grass, it is the leading products in the field of professional hockey absolutely! Next: Welcome to upgraded NIKE Football Park!